While talking about the quality of animal protein sources at a recent nutrition workshop, we were asked an interesting question: “I know grass-fed is better than grain-fed for beef, but aren’t things a little more complicated with fish?” The answer is yes – the issue with choosing high quality fish goes far beyond wild-caught vs. farmed. In fact, we discussed a wide variety of factors that go into making healthy seafood choices in our Conscientious Omnivore – From the Sea post. Turns out, however, that there are even more considerations when it comes to eating seafood. We recommend eating fish – particularly, cold-water fatty fish – in part because they’re a healthy, real-food source of Omega-3 fatty acids. But some of those fish may come with a penalty – high levels of toxic heavy metals (like mercury) that are decidedly unhealthy. When choosing fish and shellfish, you are ideally considering three big-picture factors all at once: Seafood that is (a) healthy for you, the environment and the seafood populations, (b) provides a decent amount of Omega-3 fatty acids, and (c) is relatively low in mercury. Whew. 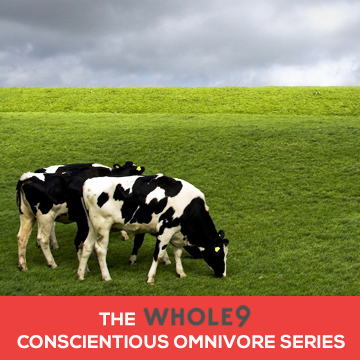 For us conscientious omnivores, this is no easy feat. Many fish meet one or two criteria, but not all three. For example, swordfish is rich in Omega-3 and has several “best choice” and “good alternatives” (per Seafood Watch), but contains the highest levels of mercury. Scallops are extremely low in mercury and are all either a “best choice” or “good alternative”, but you’d need to consume more than a pound to provide just 1 gram of EPA and DHA. Tricky, huh? But please, don’t abandon the idea of eating fish altogether. Today, we’re going to cross-reference a vast number of resources to help you arrive at the best-of-the-best, our “Seafood Trifecta”. We’ve referenced our Conscientious Omnivore piece, and the Monterey Bay Seafood Watch guide, to help you arrive at “Best Choices” or “Good Alternatives” based on the health of the fish and their wild populations, what’s good for the environment, and what’s best for your health. We then referenced the National Resources Defense Counsel and the FDA to determine fish and seafood with the lowest levels of mercury. Low levels of mercury are considered anyting testing less than 0.09 ppm (parts per million). Moderate levels are between 0.09 – 0.29 ppm. High levels of mercury test higher than 0.3 ppm. We then cross-referenced all of this information to arrive at our Seafood Trifecta recommendations below. Tip: Don’t overlook canned salmon! It’s the same great source of Omega-3 and still low in mercury. Buy brands that specify “wild-caught”. Tip: Fish lower on the food chain (like sardines) tend to have low levels of mercury. When mercury is deposited into the water, microorganisms help convert it to methylmercury, a highly toxic form of mercury. Small organisms and plants take up the mercury as they feed. As animals higher up the food chain eat those plants and organisms, they, too, take in methylmercury. The process continues, with levels of mercury increasing up the food chain. Tip: The EPA has issued Spanish and King Mackerel consumption advisories for women, men and children due to elevated mercury levels. Choose only the Atlantic version – the EPA says it’s safe to consume up to twice a week. Tip: In Europe and America, herring are often salted and smoked, or pickled. To make your own pickled herring, try this recipe, using coconut flour and your favorite saturated fat for frying. All populations are curently thought to be healthy, therefore all are considered a “best choice”. Tip: Most folks aren’t going to eat their weight in anchovies, but including them as a seasoning is a good way to get a little more Omega-3 in your diet. (It all adds up, right?) Anchovies work well to flavor tomato sauces, fish sauces, salad dressings, vegetables, chicken, and lamb. Capers and olives are also particularly good partners with anchovies. To remove some of the salt from anchovies, soak in cold water for 30 minutes, then drain and pat dry before using. Tip: Flounder is a lean, flaky fish with a mild sweet taste and firm texture. Being a lean fish, the best way to cook flounder is with wine, sauces and other liquids to help keep them from drying out. Try to avoid sauces or herbs that might overpower the delicate taste of flounder fish. Tip: Only the canned “light” versions of tuna are outside of the high mercury range. Canned albacore is considered high in mercury, and should be consumed in moderation (no more than one can every 7-14 days, according to the FDA). Furthermore, tuna is a bit more complicated than other fish, as several varieties have “good choice” and “avoid” criteria based solely on the catch method. Refer to the Seafood Watch tuna guide for additional details. We encourage everyone to get your Omega-3 from natural, real food sources as often as possible. And it’s clear from our research that wild-caught Alaskan salmon is as close to a perfect seafood as you can get – high in Omega-3, low in mercury and with a number of “best choice” and “good alternatives”. We encourage everyone to eat more salmon while it’s fresh and in season, freeze some for winter, and consider wild-caught canned salmon as a good alternative. For those of us who don’t get enough Omega-3 rich foods in our everyday diets, supplementing with a high quality fish oil (rich in Omega-3 fatty acids EPA and DHA) might be a good idea. Refer to our Fish Oil Calculator and Fish Oil FAQ for details. Finally, accept the fact that it’s simply not possible to get the full C.V. of every fish you eat. Buying canned light tuna in the grocery store means you probably won’t ever know how the fish was caught, and whether that does, in fact, make it a good choice. So just do the best you can with the resources you have on hand – because that’s all we can ask of ourselves. Questions, comments or delicious herring recipes? Share them in comments. Thank you for this! These kind of round-up posts are a lot of work, but man! It’s super helpful to have this reference. You guys are invaluable for consolidating and summarizing all the available info into PRACTICAL, applicable chunks of wisdom. I’m so grateful. THANK YOU for doing all the research for me! I’m trying to do the Whole30 without consuming any meat except eggs and seafood (I’m a pescetarian), so this helps A LOT!! @Mel: Thanks for the kind words, as always. @Merrill: You’re welcome! Read through our Conscientious Omnivore piece as well – as a pescetarian, you may want to consider bivalves as a good (and ethically responsible) source of protein. They don’t contain much Omega-3, but they’re a healthy source of protein with many “best choices” available, and could play a valuable role in your protein rotation. The Monterey Bay Aquarium Seafood Watch program has created a “Super Green” list of seafoods that have optimal levels of heart-healthy omega-3 fatty acids, low levels of environmental contaminants (e.g. PCBs, mercury, etc.) and that are caught or farmed in ocean-friendly ways. The “Super Green” list was developed in collaboration with researchers at the Harvard School of Public Health and Environmental Defense Fund (our partner in assessing contaminants in seafood). You can find the full “Super Green” list here: http://www.montereybayaquarium.org/cr/cr_seafoodwatch/sfw_health.aspx. Thanks so much for the comment – we appreciate the feedback from the Monterey Bay Aquarium. It appears as though a closed farming system (for salmon, specifically) is a much better choice than traditional open-pen farming, but I do have two questions. First, what kind of feed are the closed pen salmon receiving? “Fish pellets and fish oil” are the commonly referenced food sources, but I’m not sure what “fish pellets” are referring to. And I can’t imagine that farmed salmon in any system contains as much healthy Omega-3 fatty acids as their wild-caught counterparts… any thoughts? Finally, for consumers looking to make healthy choices, how easy is it for us to distinguish between open farming system fish and closed farming system fish in the store? From what I’ve read, less than 1% of salmon is coming from a closed farming system… which means it may be impossible to find in your local grocery store. Any ideas on whether that percentage is growing, and how consumers can make a “best choice” with the typical information they have on hand when ordering salmon at a restaurant or choosing salmon at a grocery store? Thank you again for your contribution, and everything Monterey Bay Aquarium does for us “conscientious omnivores”. Chris Kresser says the mercury issue in fish is overblown due to the fact that most contain selenium which is protective against mercury. Because of the protective factor, it’s presumably safe to eat even fish high in mercury, such on swordfish, on occasion. Eating fish high in mercury is better than eating no fish at all. Heck, even Dr. Weil agrees. Reading this at my desk I looked at the packet of tuna in the drawer and suddenly noticed it had soy as an ingredient. Same thing with the canned when I got home. Just one more thing you need to red the labels on I guess. @Don: We like that post too. Real food always wins! @Alex: Chris may be right about some of the protective factors that come with eating real fish… but if there’s an option that allows you to eat healthy, low-mercury foods and avoid any POTENTIAL down sides, I’d take that option the most often. Plus, mercury isn’t the only concern – those fish higher up on the food chain are exposed to more toxic chemicals, heavy metals, pesticides and other unsavory stuff that drifts into the ocean, which is another reason why we recommend eating lower on the food chain more often. @Chase: You may not need to supplement with fish oil at all, IF your natural Omega-3 intake is relatively high (as yours appears to be)… AND if you’re Omega-6 intake is relatively low. It’s about balancing the two, not just how much salmon you’re eating. So if the rest of your diet is pretty low in N-6 (high quality meats, no vegetable oils, not a ton of nuts and seeds, minimal dining out), you can probably consider your diet totally adequate. For many of us who are doing our best to eat well, but can’t eat perfect quality foods all the time, a small amount of N-3 supplementation helps to balance things out. Ahh…. Mercury. How often would you consider it safe to eat a “clean” canned tuna variety, like that from Whole Foods? They claim recent testing of their albacore comes in at 0.056ppm. Do you think twice a week is too often? That’s a call you’ll have to make for yourself. I used to eat a LOT of albacore tuna, and now I’m overly cautious about potential mercury overload. I’m doing more canned salmon these days, with the occasional albacore thrown in for variety, but I can’t say whether twice a week is “acceptable” for you.